You all know how much I love good old H&M, so it’s a no brainer that they are going to crop up in my wishlist posts every now and again. I must admit I’ve been lusting after their homewares more than their clothing as of late. That seems to happen to everyone though when they are planning a move! Dan and I are hopefully taking the plunge in the next couple of weeks and are looking for our first place to rent, so a word of warning, lots of house-y related blabber coming your way very soon! For now though I thought I would drool over their pretty fashion offerings, and very pretty they are indeed! I love to get my wardrobe cleaned up and ready for Spring with a few new additions to freshen everything up, and pretty much everything here would sit perfectly within mine at the moment. I love the pastel palette for Spring and always find these colours really wearable. They are shades I always feel comfortable in. I’m really liking the pale pink chunky and fluffy knits, perfect for throwing over sweet little dresses like the printed one at number 9, and toughened up with a pair of chunky boots or brogues. On the flip side of that, I’m also loving tapered sweat pants, and those grey marl ones are spot on for dressing up or down. They’d look amazing with a white collared blouse buttoned to the top and a pair of black pointed heels for a chic workwear look, but would look just as good with some bright trainers and a simple printed tee tucked in. The tapered leg makes them so versatile! And what would Spring be without a good dash of florals and sprinkling of lace? Please, someone make the rain stop! What do you think of H&M’s current range? 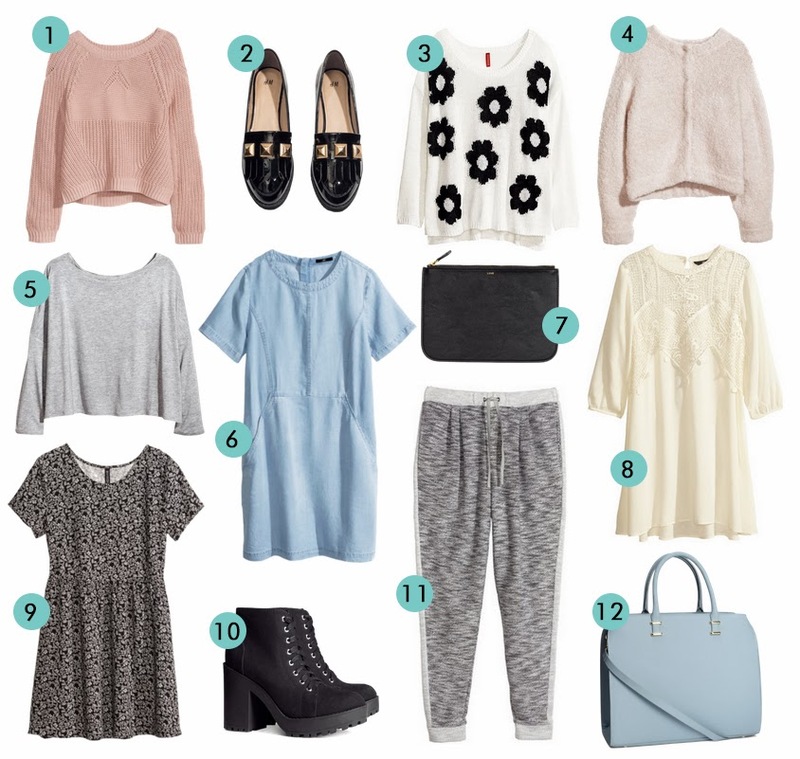 What’s on your wishlist for Spring? Love your wishlists; that lace dress is a beauty! 2, 9 and 12 please! Cuteeeee!! I am a bit obsessed with denim dresses!! I think I have 3 so far, but I am sure that might become 4!!! Eek!! !